The trek route passes through hills and valleys with a variety of tropical plans and wide open spaces. En route, vegetarian meals will be prepared and served and country tents will be pitched for holing up in the night. Remember to listen to unusual and strange adventure stories of the former poachers, now your guides and protectors of the forests. 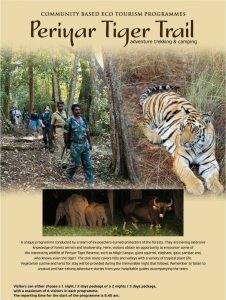 Tiger Trail has become immensely popular internationally and provides livelihood for 13 ex-poachers. It has also contributed substantially in keeping vigil in the most vulnerable parts of the Tiger Reserve.